Picabo Street, one of a handful of really great American downhill skiers, could have won even more before now had her career not been blighted by a catalogue of painful injuries, notably to her legs. The American achieved her best results in a golden period between her first major victory at the world alpine skiing championships in 1996 and the Olympic Games at Nagano in 1998. But these two years were also punctuated by a series of frustrating injuries, the first of which came in a fall at Vail, in the US, in December 1996. The ligaments of her left knee were so badly damaged she was out of action for over a year. Another fall and a serious injury in March 1998 again ruined the next 18 months, and she now has a fight on her hands if she wants to mount some sort of credible challenge at the Salt Lake City Games. Picabo was given her name rather late in life after her hippy parents, Stubby and Dee, came up with the idea of allowing their daughter make up her own mind what she should be called. So for several years Picabo happily responded to the name "Little Girl." One day, when Stubby and Dee were playing the game of "peekaboo", Stubby thought of the Indian word "Picabo" and asked his daughter how she liked it. "Little girl" said she liked it just fine, and the name stuck. Specialist ski coaching began, but Picabo proved a handful and before long she found herself packed her off to her parents' new home in Hawaii in disgrace. Her father took her in hand and soon had her facing up to some hard facts of life, notably while the two were labouring on the construction of a wall for a friend. The story goes that it was the back-to-basics satisfaction the young rebel got from handling the bricks and mortar that gave her a new sense of responsibility. 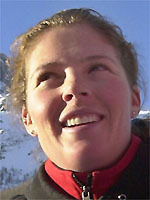 Street won her first World Cup race in 1995 at Lake Louise in Canada and the World Cup downhill title the same season. She won the downhill at the 1996 world championships and was then injured. She recovered in time for the 1998 Olympics, where she won the super-G and was then injured again, badly this time, at Crans Montana. The terrifying wipe-out was so serious it not only ended her season but had her doubting whether or not her nerve would hold the next time she looked down a championship downhill course. Retired from the slopes, she launced herself into the promotion of her sport which in America is considered as a hobby. She was even named chief organiser of alpine events at Park City, site of the giant slalom at the 2002 Olympics in Salt Lake.